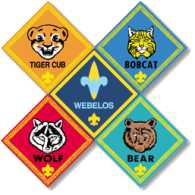 Our first pack-meeting for 2014-15 is scheduled for Saturday and as has been our custom for the September event, this will be a family-oriented welcome-back cookout to which friends and family are invited including friends of the scouts who may be interested in learning more about Cub Scouts. Among the festivities, the families of Webelos Den 11 and Tiger Den 3 are organizing Pack 99's second "Cub Mudder", an age-appropriate version of the "Tough Mudder" for adults. This activity is not just for the scouts. Siblings and friends are welcome to run the course, too. Parents we need your help with food! The pack will provide hamburgers, hot dogs and water. Please bring finger desserts or sides such as a tossed salad, cole slaw, potato salad, or fruit. If you’re a new scout and would like to bring something to share, simply bring along a bag of chips. - Clothes and shoes that are OK to get dirty; The kids will get wet and dirty! - Extra layers: prepare for the temperatures to drop to the 50s-F.
Lastly, we're going to need some help from adult volunteers to run some of the stations or go through the course with the kids. If you are able to run a station, please see our cubmaster, Tony Gambescia, for instructions and a station assignment when you arrive. Thanks. We are looking forward to seeing everyone again for another great year. See you on Saturday.